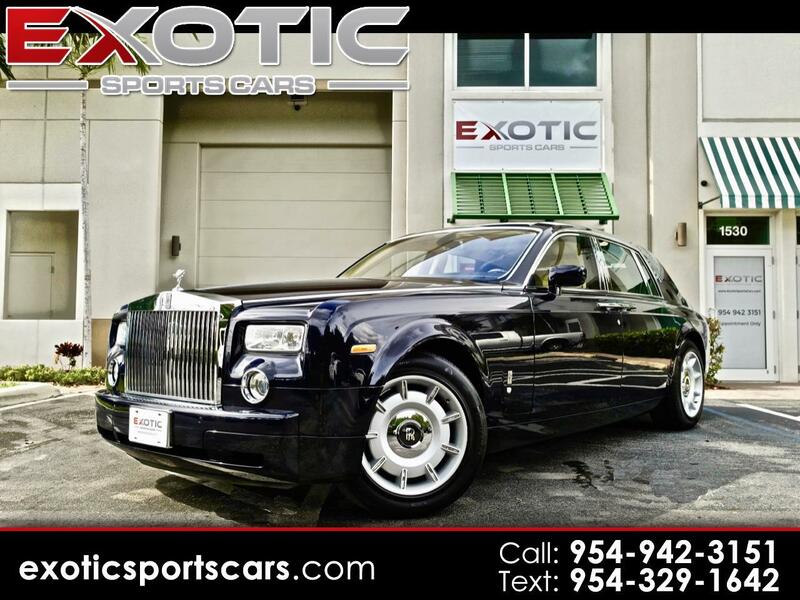 Exotic Sports Cars is proud to present this extremely well taken care of 2004 Rolls Royce Phantom. Blue Velvet Paint with Oatmeal interior with Chrome wheels, this is one of the classiest color combinations possible for such an austere automobile. With just over 36,000 miles, this 2 owner car has been gently used and garage kept for its entire life. Despite its age, it still have an excellent package of technology include parking sensors all around the car, navigation, and cell phone connectivity. Made for a king, this car has incredible comfort and space for all its seats. 18 way power front seats giving you the ultimate luxury comfort. The Spirit of Ecstasy (Flying Lady) automatically retracts when the car is locked or is tamped with. 15 speaker Lexicon sound system is still top of the line. This car still holds a massive presence anywhere in the world, and is perfect for someone looking for a vehicle to complement their class and elegance. Message: Thought you might be interested in this 2004 Rolls-Royce Phantom.